"An exemplary biography—exhaustively researched, fair-minded and easy to read. It can nestle on the same shelf as David McCullough’s Truman, a high compliment indeed." —The Wall Street Journal The definitive biography of Herbert Hoover, one of the most remarkable Americans of the twentieth century—a wholly original account that will forever change the way Americans understand the man, his presidency, his battle against the Great Depression, and their own history. An impoverished orphan who built a fortune. A great humanitarian. A president elected in a landslide and then resoundingly defeated four years later. Arguably the father of both New Deal liberalism and modern conservatism, Herbert Hoover lived one of the most extraordinary American lives of the twentieth century. Yet however astonishing, his accomplishments are often eclipsed by the perception that Hoover was inept and heartless in the face of the Great Depression. Now, Kenneth Whyte vividly recreates Hoover’s rich and dramatic life in all its complex glory. He follows Hoover through his Iowa boyhood, his cutthroat business career, his brilliant rescue of millions of lives during World War I and the 1927 Mississippi floods, his misconstrued presidency, his defeat at the hands of a ruthless Franklin Roosevelt, his devastating years in the political wilderness, his return to grace as Truman's emissary to help European refugees after World War II, and his final vindication in the days of Kennedy's "New Frontier." Ultimately, Whyte brings to light Hoover’s complexities and contradictions—his modesty and ambition, his ruthlessness and extreme generosity—as well as his profound political legacy. Hoover: An Extraordinary Life in Extraordinary Times is the epic, poignant story of the deprived boy who, through force of will, made himself the most accomplished figure in the land, and who experienced a range of achievements and failures unmatched by any American of his, or perhaps any, era. Here, for the first time, is the definitive biography that fully captures the colossal scale of Hoover’s momentous life and volatile times. The definitive biography of Herbert Hoover, one of the most remarkable Americans of the twentieth century—a wholly original account that will forever change the way Americans understand the man, his presidency, his battle against the Great Depression, and their own history. 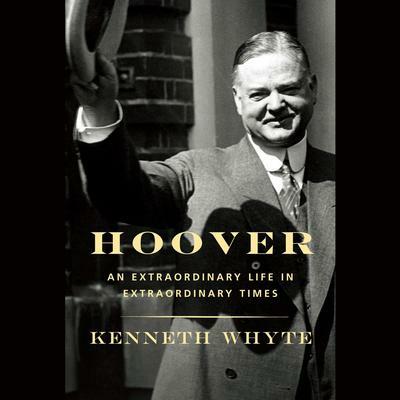 Now, Kenneth Whyte vividly recreates Hoover’s rich and dramatic life in all its complex glory. He follows Hoover through his Iowa boyhood, his cutthroat business career, his brilliant rescue of millions of lives during World War I and the 1927 Mississippi floods, his misconstrued presidency, his defeat at the hands of a ruthless Franklin Roosevelt, his devastating years in the political wilderness, his return to grace as Truman's emissary to help European refugees after World War II, and his final vindication in the days of Kennedy's "New Frontier." Ultimately, Whyte brings to light Hoover’s complexities and contradictions—his modesty and ambition, his ruthlessness and extreme generosity—as well as his profound political legacy. Often ranked as one of our worst presidents—his very name evokes Depression-era shantytowns—Hoover gets a reconsideration here that sweeps over his entire career… [Whyte] charts Hoover's rise from childhood poverty to business mega-success, then reminds us of Hoover’s large-scale humanitarian works during World War I and after the 1927 Mississippi floods and his efforts (however thankless) to combat the Great Depression. And he was tasked by President Harry Truman himself with aiding European refugees after World War II, which not everyone knows. Get reading. —Barbara Hoffert, Library Journal, "Barbara’s Picks"
As its subtitle proclaims—this audiobook is extraordinary. In Hoover, Whyte profiles a president suited more to a corporate office than the helm of a great democracy. Once, Herbert Hoover had moved mountains to feed millions in war-torn nations, but as president, he could not allay his country’s suffering. Reader Richard Ferrone’s delivery is a faultless medium for Hoover’s globe-spanning story. His voice emphasizes the grit shown by America’s greatest humanitarian, whether pursuing success or overcoming failure. Kenneth Whyte is the author of several books, including The Uncrowned King: The Sensational Rise of William Randolph Hearst, named a Washington Post and Toronto Globe and Mail Book of the Year and a nominee for four major Canadian book awards. He is a publishing and telecommunications executive and chairman of the Donner Canada Foundation. He was formerly editor in chief of Maclean’s magazine, editor of the monthly Saturday Night magazine, and founding editor of the National Post.